SAN FRANCISCO, Calif. /California Newswire/ — The Pacific Pinball Museum (PPM) in California has signed an agreement with Phaeno Museum of Wolfsburg, Germany to create a never-before-seen exhibition of pinball art and science. 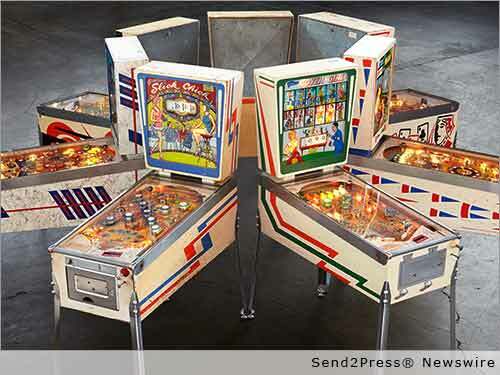 This will mark the first time a major exhibition of pinball art and exhibits has made the journey to Europe. The show supports Science, Technology, Engineering, Arts and Mathematics (STEAM) curriculum. The series of interactive exhibits will complement murals and vintage pinball machines from PPM's collection. In accordance with the PPM mission, the exhibition was created to inspire an interest in art, science and history through pinball. Opening day for "The Art and Science of Pinball" at the Phaeno will be May 15, 2015. In 2014, Executive Director Michel Junge from the Phaeno Museum visited San Francisco's Exploratorium in search of new exhibits to display in Germany. Following that, Junge went across the bay to the PPM in Alameda and met PPM Executive Director Michael Schiess. The two executive directors envisioned working together on an exhibition. "The Art and Science of Pinball" will present art in a big way: ten hand-painted acrylic on canvas murals by artists Dan Fontes, Ed Cassel, Eric Kos and d'Arci Bruno. These giant works of art average 10 feet by 10 feet in size and reproduce backglass art from various eras of pinball history. These colorful masterpieces provide an excellent background for the exhibition as a whole. Twenty playable pinball machines were chosen from the PPM's extensive collection along with selections from the Larry Zartarian and Melissa Harmon collections to complement the other exhibits. The games date from the electromechanical era of pinball (1976 and earlier) that are rarely seen in public today. All the machines demonstrate pinball as an art form in both the aesthetics and engineering. For more information about the Phaeno Museum visit http://www.phaeno.de/ . "Kunst unt Wissenshaft von Flipper."